DBol-GH is a ‘Superstar’ amongst our range of great products. It’s a potent HGH supplement for bodybuilding, that will increase your growth hormone levels, as well as build lean muscle mass quickly. The secret behind DBol-GH lies in its core ingredients such as Bovine Colostrum and Beta-Ecdysterone which is a natural ecdysteroid comparable to anabolic steroids. Buy DBol–GH Online – With a 90-Day Money Back Guarantee! clearly showed that it was far more effective than the illegal anabolic steroids, in terms of extreme muscle building, rapid post workout recovery, boosting lean muscle mass, boosting testosterone levels, burning the stubborn fat, and more. Also unlike other similar products, DBol–GH does not contain DHEA, an ingredient banned by NCAA. This is why it’s so popular among professional bodybuilders across the world. 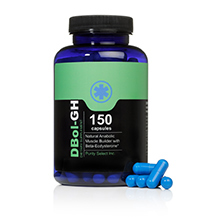 So if you are looking for a legal and safe HGH supplement, which will dramatically increase muscle mass, improve strength as well as performance, helps to increase natural production of growth hormones, then DBol – GH is the perfect choice for you. So I was considering your stack of Weight Builder 4. Now my question is will it help burn off some stubborn stomach fat I cannot shake and how long to see results of muscle mass and what happens to those gains once i stop taking the stack? Is it alright to take this product while using other supplements? I prefer to split the dosage and take 3 pills in the morning and 2 pills in the late afternoon or evening. The main thing is to be consistent and take them about the same time each day. Hi, I was wondering if DBol-GH is a new formula of Dian-Bol, or is it two different supplements.